At its annual shareholders’ meeting on January 19, 1983, Apple announced two new products that would play a pivotal role in the future of the company: the Apple Lisa, Apple’s original GUI-based computer and the precursor to the Macintosh; and the Apple IIe, which represented a natural evolution to the highly successful Apple II computer line. One of these platforms met an early end, leaving behind technology that shaped the entire industry. The other, built on proven technology from an engineering genius, remained a reliable breadwinner during uncertain times in the early life of the Macintosh and carried Apple’s most popular 8-bit computer line to its natural conclusion. The Lisa introduced a completely new paradigm—the mouse-driven graphical user interface—to the world of mainstream personal computers. (Note that the release of the Xerox Star workstation in 1981 marked the commercial debut of the mouse-driven GUI.) The Lisa’s elevated retail price of $9995 at launch (about $23,103 in today’s dollars), slow processor speed (5MHz), and problematic custom disk drives hobbled the groundbreaking machine as soon as it reached the market. The impact of the Lisa’s GUI was so profound that dozens of companies jumped on board with imitative and catch-up products in the mouse-driven GUI space—not the least of which was Microsoft, which first announced its Microsoft Windows operating environment in November 1983, ten months after the Lisa’s debut. Perhaps even more profound was the effect the Lisa had on Apple itself. While the Lisa’s development initially began under Steve Jobs’s guidance, the Apple cofounder was later ousted from the project. This prompted Jobs to take charge of another computer project within Apple, Jef Raskin’s low-cost appliance computer—the Macintosh. Under Jobs’s feverish and singular guidance, the Macintosh, released just one year later, flowered into a low-cost competitor to the Lisa, sealing the fate of the awkward, overpriced computer. The rest of that branch of history should be at least somewhat familiar to readers. A few of the Lisa’s achievements that the Macintosh emulated include the mouse and the bitmapped display, the desktop paradigm, representational icons, proportional fonts, pull-down menus along the top of the screen, and overlapping windows (something Microsoft Windows didn’t offer until version 2.03 in 1987). The Lisa also debuted a few features that the Mac has never fully imitated. In the most dramatic example, the Lisa’s OS (the Lisa Office System) handled user-generated files in a completely document-centric manner. That is, one did not launch an application and then open a file from within that application, as is common in Mac OS X and Windows today. Instead, one “tore off” a blank document from a virtual stack of “paper,” which created a user-editable document in the file system that the user would then double-click to open in the appropriate application. In a sense, Lisa’s document-centric approach was the exact opposite of the paradigm advanced by iOS today, in which the user deals solely with applications at the OS level and not documents individually. Also, in a significant step forward for user convenience, the Lisa included the world’s first computer “soft” power switch, which, when pushed, initiated an automatic shutdown sequence that saved and put away all documents safely before powering down the system. After the launch of the Macintosh in 1984, the Lisa fell far behind in sales, and it became clear that the Mac represented the future of Apple. So began the Lisa’s absorption into the Macintosh ecosystem. 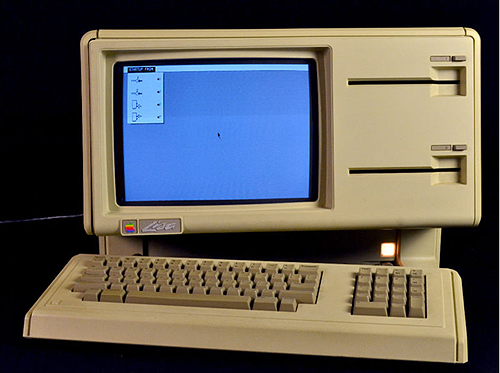 First, the Lisa adopted Mac-like features such as the 3.5-inch floppy disk drive and a new exterior design that appeared in a much-needed 1984 revision commonly dubbed the Lisa 2. Then the Lisa gained the ability to run Macintosh software with the MacWorks software-emulation environment. To this day, the Lisa remains one of Apple’s most fascinating dead platforms— especially since its early demise entombed pioneering interface concepts that have yet to be fully replicated by any Apple platform. The story of the Apple IIe began with Apple’s first high-profile failure, the Apple III. Launched in 1980, the Apple III targeted the business market with an over-engineered, high-priced machine whose Apple II compatibility Apple purposely crippled in the name of market differentiation. Around the time of the Apple III’s launch, Apple was so sure of the new computer’s success that it had halted all future development of Apple II-related projects. But by 1982, as it became clear that the Apple II wasn’t going away (in fact, it was becoming more popular than ever), Apple scrambled to upgrade its aging Apple II line, which had last been refreshed in 1979 with the Apple II+. The result was the Apple IIe, which packed in several enhancements that regular Apple II users had been enjoying for years thanks to a combination of the Apple II’s plentiful internal expansion slots and a robust third-party hardware community to fill them. Among those features were 80-column text-mode support, support for lowercase letters (yep, the original Apple II and II+ supported only uppercase letters), and 64KB of RAM standard (expandable to 128KB). Most importantly for Apple, the Apple IIe drastically lowered the chip count on the system’s motherboard from over 100 chips to 31, allowing Apple to manufacture the computer at a lower cost while extracting a higher profit from each unit. Upon its release in 1983, the Apple IIe proved immediately popular, and it soon became the standard Apple II model against which all others would be compared. The Apple IIe’s reliability and backward compatibility with a rich library of Apple II software made it a fixture at schools, where a generation of American schoolchildren grew up playing Apple II-based educational games such as The Oregon Trail, and eventually, Number Munchers. Thanks to the IIe, the Apple II series remained a steady source of income for Apple during an uncertain period in the mid-1980s when the Macintosh wasn’t selling in the volume that the company had anticipated. Even after the introduction of the vastly upgraded Apple IIgs in 1986, demand for the Apple IIe remained steady, and Apple marketed a version of the IIe all the way up until 1993, when the company finally pulled the plug on the stand-alone Apple II line (the Apple IIe Card for Macintosh computers was spared for two more years). By 1993, when Apple discontinued the II series, the Macintosh was firmly positioned as the future of the company. But those who used the Apple IIe and the Lisa in their prime would not soon forget the fruitful impact both systems had on the course of Apple’s history.